Intel presents the SSD 710 series for data centers, these disks use 25nm MLC High Endurance Technology (HET) NAND and are available in capacities of 100GB, 200GB and 300GB for $649, $1,289, and $1,929, respectively. The endurance of these disks is said to be 30x better than Intel's 320 Series for consumers. Intel Corporation announced today its latest solid-state drive (SSD), the Intel Solid-State Drive 710 Series, a purpose-built Multi-Level Cell (MLC) data center SSD and replacement for the Intel X25-E Extreme SSD. While the Intel X25-E was based on more expensive but highly reliable Single-Level Cell (SLC) NAND flash memory, the Intel SSD 710 uses compute-quality Intel 25-nanomenter (nm) MLC NAND flash memory with Intel High Endurance Technology (HET) to deliver the endurance and performance necessary for data center, financial services, embedded, Internet portal, search engine and other demanding storage and server applications, but at a greater value. 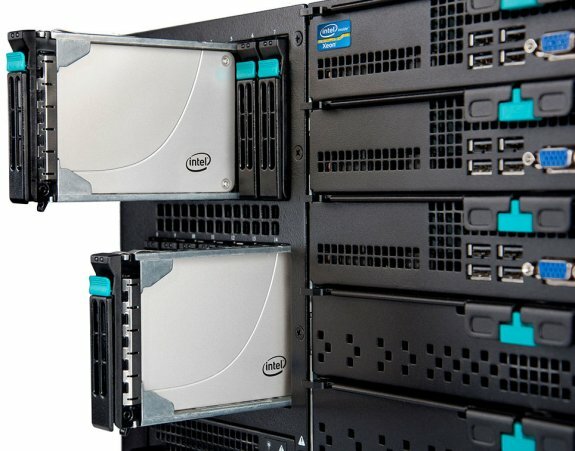 "The Intel SSD 710 Series gives enterprise data center and embedded users extreme endurance and performance, enabled by Intel's High Endurance Technology based on Intel 25nm MLC NAND technology," said Rob Crooke, Intel vice president and general manager of the Intel Non-Volatile Memory Solutions Group. "Intel SSDs are widely deployed in the data center due to their performance, reliability and value. Our latest SSD product family offers more than 30 times the write endurance of our current MLC SSDs, plus improved performance and new features, such as power-loss data protection and surplus arrays of NAND for enhanced reliability." The Intel SSD 710 delivers nearly the same endurance as SLC-based NAND SSDs, yet utilizes the higher capacity and more cost-effective MLC NAND. It achieves write endurance out-of-the-box of up to 1.1 Petabytes (PB) and comes in 100-Gigabyte (GB), 200GB and 300GB capacities. Targeted for I/O-starved applications, the Intel SSD 710 achieves a 4K random write performance of up to 2,700 input/output operations per second (IOPS) and 4K random read performance of up to 38,500 IOPS across the full span of the drive, making this a suitable replacement to an SLC SSD or multiple enterprise-grade hard disk drives (HDD). In addition to performance, the Intel SSD 710 can replace many power-consuming HDDs with a single SSD to help reduce data center energy costs. "Cisco and Intel teams have worked closely, looking at the requirements for servers in the data center – IT organizations today more often run out of memory, and need memory density as well as capacity and performance," said David Lawler, vice president of product management for Cisco. "The Cisco UCS B230 M2 server offers the highest density memory capacity, and is one of the highest-density two-socket, half-width form factors powered by the Intel Xeon E7-2800. Cisco will offer the Intel SSD 710 Series to further increase the performance and storage capacity in the UCS B230 with two local drives offering 100GB each in September and up to 300GB each in the fall." The Intel SSD 710 also includes increased reliability and security features. These include enhanced power-loss data protection to reduce potential data loss during a power failure; added data security with surplus NAND flash memory to provide system protection should a NAND die fail; Advanced Encryption Standard (AES) with 128-bit pre-configured encryption technology to protect the data from an external threat or internal system issues and Temperature Monitoring and Logging containing an internal temperature sensor that can be monitored using two self-monitoring analysis and report technology (SMART) attributes to prevent downtime. Positioned for high write usage models, the drive can also be over-provisioned by the user to achieve up to 80 percent greater write endurance, creating an outstanding storage value. Intel HET combines NAND silicon enhancements and unique SSD NAND management techniques to extend the write endurance of MLC-based SSDs. Intel HET comprises Intel-developed firmware, controller and high-cycling NAND for optimized endurance and performance for the heavy loads of data crunching and writing experienced in 24/7 data centers or scientific, financial or other high-intensity usage models. Firmware enhancements from Intel include optimized error avoidance techniques, write amplification reduction algorithms and system-level error management beyond the normal industry Error Correction Code (ECC) standards. Providing a better dollar-per-GB value than its previous-generation Intel X25-E SSD, the Intel SSD 710 Series is priced at $649 for the 100GB version, $1,289 for the 200GB, and $1,929 for 300GB, all based on 1,000-unit quantities. It is backed by a 3-year limited warranty.